This multi-talented West Midlands group gained international success in the late 1960s and early 1970s, particularly in the USA where as a three piece they attracted a huge following. In Britain, they are remembered mostly for some memorable and ground-breaking singles and albums that scored high chart placings. Traffic was formed when Steve Winwood, who was the focal point of the Spencer Davis Group decided to move beyond the restrictions of the group and form a band with three other Birmingham area musicians. Jim Capaldi had formed his first band at the age of fourteen and was soon recording for Pye records with the Hellions. Shortly thereafter, he was gathering rave reviews in a band called Deep Feeling which he shared with fellow Traffic founder Dave Mason & Family founding member Poli Palmer. The band played rock & blues and locally were in a league of their own. Guitarist Dave Mason had been a member of the Worcester group The Hellions in the early 1960s along with Jim. Jim had continued with The Hellions who were re-named Deep Feeling after Dave Mason's departure to work as a roadie for the Spencer Davis Group. Saxophone / flute player Chris Wood who was born in Harborne, Birmingham on 24 June 1944, had been a member of the group Locomotive and previously, had been in Sounds Of Blue who later became Chicken Shack. These four musicians would often get together on stage at a hip club called The Elbow Room on Aston High Street in Birmingham run by an enigmatic character called Don Carlos and it was there that the idea for Traffic was formed. With Jim Capaldi and Dave Mason eager to form a new band, Steve Winwood agreed to join the partnership along with Chris Wood and so the four retreated to a secluded (and reportedly haunted) cottage in Aston Tirrold, Berkshire in order to write and rehearse new material. The cottage was to become a place of legend as regular visitors included musicians such as Eric Burdon, Pete Townshend and Eric Clapton as well as Trevor Burton (of The Move) amongst many others. The new group was named Traffic (an action that prompted an obscure south London band called Traffic Jam to re-name themselves Status Quo) and was given full financial backing by Island Records boss Chris Blackwell who intended to promote the band to help the launch of Island Records as a major act label. Traffic went on to be the spearhead which successfully launched Island Records as an Internationally recognised label. 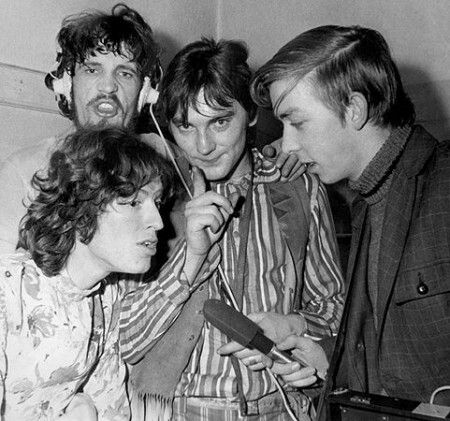 With Steve's involvement, the group was assured at least initial attention and Traffic's first single Paper Sun was released in the summer of 1967. With production by Jimmy Miller Paper Sun was the first song which Jim and Steve wrote together Jim Capaldi supplying the captivating lyrics and Steve the music. The song was just right for the times and featured an Indian sitar played prominently by Dave Mason. The single reached No. 5 in the UK charts and brought the group to the forefront of the British psychedelic or "flower power" movement that was sweeping the country at the time. The next Traffic single was composed and sung by Dave Mason. The song was supposedly inspired by a dream Dave had at the cottage (although certain substances he was taking may have also played a part) and the recording featured the innovative use of the Mellotron. Hole In My Shoe captured the psychedelic atmosphere of 1967 with as much impact as The Pink Floyd's See Emily Play although this song was to signal the beginning of the end for the Mason involvement in the group as the other three members were eager to get away from pop and into more absorbing material. By November 1967, a third Traffic single entitled Here We Go Round The Mulberry Bush had been released which had more to do with the fact that it was used as the title track of a film than the band's wishes. It was to be their last single as the band turned their back on looking for singles success to concentrate on the creative freedom which albums offered. Traffic's live shows at this time included a lot of on-stage jamming and improvisation as well as extended solos by the individual members - something quite unusual in Britain for a pop group in those days and an indication of things to come. December of 1967 saw the release of Traffic's first album entitled Mr Fantasy which showcased the individual talents of the members and put paid to any suggestion that Jim Capaldi, Chris Wood & Dave Mason were to be a backing group for Steve Winwood. The album also showed Jim and Dave Mason writing as separate entities and indicated a clash of song writing styles with Mason's commercial compositions contrasting alongside the more jazz and blues or soul influenced songs of the other group members. It was often said that whilst Steve was the genius of Traffic, Chris Wood was the heart and Jim Capaldi the energy - It was Jim who had named the band and Jim came up with the unique cube album cover design idea one day whilst in the studio with the band and in the prolific writing partnership he had with Steve and to a lesser extent Chris. Jim would invariably instigate by writing the lyrics first and then pass them on to Steve & Chris who in turn would add music. Jim also wrote songs himself on guitar and piano. Possibly spurred by the success of Hole In My Shoe Dave Mason left the group in December, supposedly to begin a solo career, only to rejoin the band in May of 1968 but was finally gone by October and a few months later, the group activities ceased for a while. Dave Mason never toured the USA as a member of Traffic and was never part of their biggest period. Dave had moved permanently to the USA by the early 1970s and established a successful solo career there which apart from making three well selling albums, included collaborations with Mamas & Papas singer Cass Elliott. Despite battles with drugs and alcohol, he scored a big hit single in the States with We Just Disagree in the late 1970s and continues to tour there although he remains almost unknown in his native Britain where he is remembered for his contributions as an early part of Traffic. Late in 1968 fearing the worst, Island Records had released a "new" Traffic album called Last Exit made up of leftover recordings, single B-sides, and some assorted live material. A compilation entitled The Best Of Traffic was also released. Meanwhile Steve Winwood teamed up with legendary guitarist Eric Clapton and drummer Ginger Baker and along with bass player Rick Grech, formed the much publicized and short lived "supergroup" Blind Faith. When that group split, Winwood joined Ginger Baker's new group "Airforce" which at one time had also included Birmingham musicians Trevor Burton and Denny Laine. Mason, Capaldi and Wood tried forming another band called Wooden Frog but it was short-lived and had split up by March 1969. In January 1970, Steve Winwood started work on a long-awaited solo album and was joined in the studio by Jim Capaldi and Chris Wood. The resulting sessions were so successful that Traffic was reformed as a trio and the album produced from the recordings entitled John Barleycorn Must Die was released as a group effort. The album was critically acclaimed and became a major seller. After enlisting top session players to the line-up, Traffic toured both the UK and the USA where a live recording of their version of Gimme Some Loving (originally recorded by Steve Winwood's old band The Spencer Davis Group) made the charts. Further Traffic albums were released in the early 1970s and were big sellers, particularly in America where the group had a huge following, but by 1974, Steve Winwood, Jim Capaldi and Chris Wood were all concentrating on solo careers. Chris Wood died from liver disease in July of 1983 at only 39 years of age. Jim Capaldi was the first Traffic member to enjoy solo career success, he released his first solo album in 1974 and scored a top five hit in Britain in October of 1975 with Love Hurts whilst Eve and Its All Up To You had also been chart records on either side of the Atlantic. His best known US hits however coming later in the career when from the Fierce Heart release with Atlantic Records in 1982 That's Love was a US top 30 and Living On The Edge a US Top 40 hit and then again in 1987 Something So Strong from his Island Records album was a top 5 AOR hit. For over 10 years Jim's US releases would attract major radio airplay and in that period he was awarded either BMI or Ascap awards for most played songs on US radio on 5 occasions. Jim wrote songs for and appeared on recordings by many other well known performers during his career and made several best-selling albums during his 11 album solo career. Jim normally contributed something to Steve's solo albums with either co-writes or performances and Steve reciprocated with performances or as in the Fierce Heart Album by co-producing with Jim and so it was almost inevitable and welcomed all over the world when in 1993 there was a Traffic reunion involving them both and the band released the album Far From Home, subsequently touring the USA and the UK. A gifted songwriter, outside of his membership of Traffic and his solo recordings Jim often supplied material to other acts and his biggest success in that field was to contribute Love Will Keep Us Alive to The Eagles reformation CD Hell Freezes Over in 1994 - It was unique as the only non Eagles penned composition on the record and has become a multi platinum success for them. It would also surprise people to learn that at the other end of the spectrum he wrote the lyrics to the Reggae anthem This Is Reggae Music recorded by Zap Pow. Jim Capaldi passed away on January 28, 2005 after a battle with cancer. Steve Winwood appeared on recording sessions for many well known musicians throughout the 1970s and in 1981, began a predictably successful solo career. His 1986 album Back In The High Life received a Grammy Award for Album of the Year in the USA while hit singles such as Valerie and Higher Love have scored high chart placings in many countries. Although Steve Winwood has not enjoyed such a high profile in recent years, he remains a major talent on the world music scene and continues to record and perform today in between spending time at his farm in Oxfordshire and house in Nashville. Traffic were inducted into the Rock And Roll Hall Of Fame in 2004.